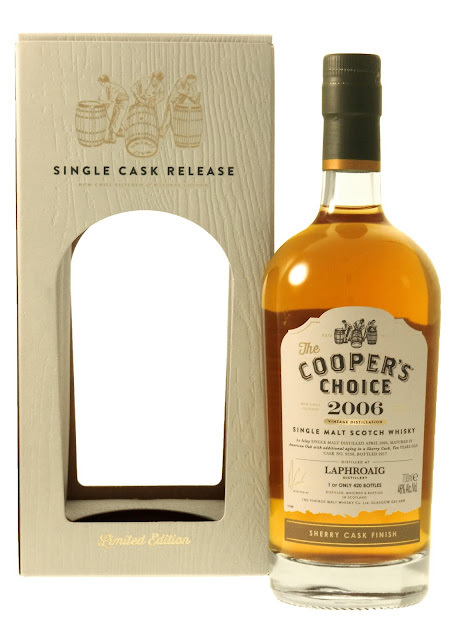 Single Cask Bowmore & Laphroaig bottled by Cooper’s Choice! The 16 year old Bowmore is from bourbon cask no.223 which gave 320 bottles. Out of these 132 bottles are available for Sweden. It has been bottled at 46% ABV and you can view the product here. The 10 year old Laphroaig has been finished in sherry cask no.9530 (Sadly i have no info on what kind of oak, what kind of sherry, or info on for how long the whisky has been finished in the cask). This Laphroaig is bottled exclusively for the swedish market. The cask gave 420 bottles, it has been bottled at 46% ABV and you can view the product here. Ok, let's start with the Bowmore! Salty seawater with vanilla, definitely more focus on salt than on vanilla, soft fudge-yness in the background and hiding behind that is sweet liquorice. There seems to be two opposing but well intertwined scents; salt and liquorice versus vanilla and soft fudge. Not so much more than that. Oh wait, there is also grapepeel/-skin (more peel/skin than juice anyways…). Interestingly enough, I would not at all describe this one as peaty, rather as salty. In conclusion on the nose, Either this dram can be described as a ”clean”/”pure” bourbonmaturation that is not very complex, or it can be described as ”simple”, it might just be a choice of words. Starts off medium salt and then moves very quickly (around two seconds) into a kind of ”flat” or one-dimensional smoke with quite evident traces of elderflower. After that it tastes kind of like licking a wet smoked stone (whatever that is…). After that, not much at all happens. The taste can rightly be described as ”simple” rather than ”clean”/”pure”. In fact, quite boring. It is not often that it happens, but this dram was as the nose suggested very ”simple”. Quite frankly, I do not think that a higher ABV would have helped. This dram just shows that the independent bottlers do not always get a hold of as good casks as the distilleries themselves release and/or use for their bottlings. Peaty, almost smoky, with a medium salty-ness. The peat is like smoked or burned grass intermingling with a quite creamy vanilla. The vanilla-ness draws very delicately into dry sherrynotes and interestingly enough something reminding me of cinnamon (for me it is very unusual to find cinnamon in a whisky). The rather smoky peat gets along very well with the sherryness. There is, so to speak, not too much sherry influence, rather it is ”just enough” and is not covering the peat. In fact I would say that it’s a perfect match, maybe even very beautiful. The peat in this one is absolutely delicious, smells exactly like the peated malt of Laphroaig soaked in the perfect amount of sherry sweetness. Oh wow! I did not expect this, definitely more salt than peat. There is however more peaty-ness than there is sherry influence. Sadly the sherry influence is quite short and a bit to ”flat” for my taste. The sherry finish can not have been very long om this one, the salt overthrows the sherry. In the finish/aftertaste everything is quite ambivalent; the sherry component is not very well integratated with the peatyness and the saltyness, it’s hard to explain but it is as if they both stand out and they do not leave room for each other. In the late aftertaste all that remains is salt and flat peat with quite big traces of barley. Understand me the right way peoples, this is a good whisky but I would not say that it was ready to be bottled quite yet. 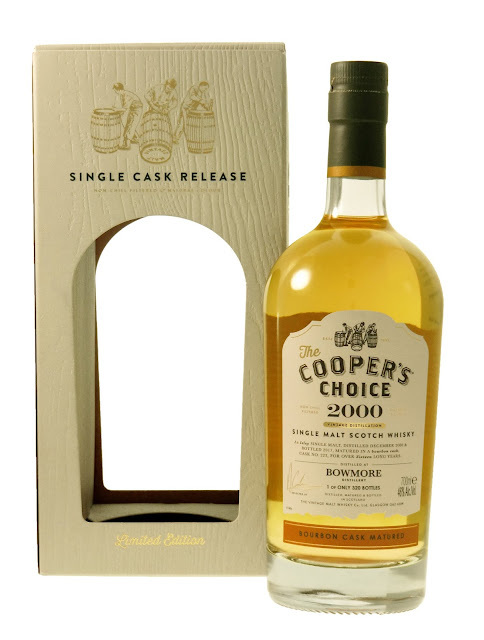 Once againg, also this dram shows that the independent bottlers do not always get a hold of as good casks as the distilleries themselves release and/or use for their bottlings. Out of these two I would choose the Laphroaig, it is definitely the best of the two. They are both quite simple but I would go for the Laphroaig. Big thanks to the nice people at Symposion for sharing these samples and for the opportunity to review and try them before they are released! Sláinte!